Ahhh, back from an amazing trip in Savannah, GA. I know, some people head north during the summer months to escape the heat, but we went for it. We really found that it wasn’t much hotter than Charlotte. I thought I would break up the trip a bit into parts and write several posts. 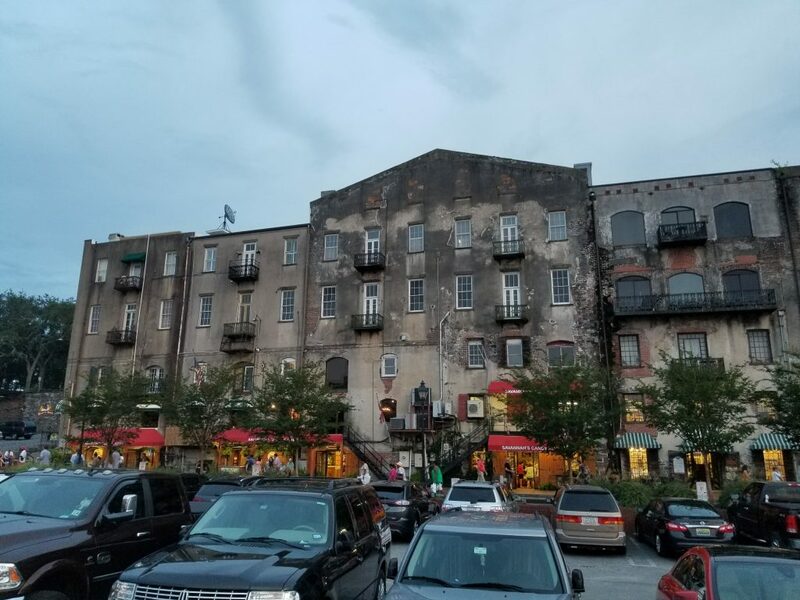 We stayed in the Historic District in Savannah, and found it to be a great place to walk to restaurants, shops and Forsyth Park. The air conditioning was icy cold and perfect for when we had to leave the pups for the morning. We did spend a good bit of the first day exploring and walking everywhere! I love the greenery from the Spanish Moss, to the Magnolia trees and more in this Southern state. 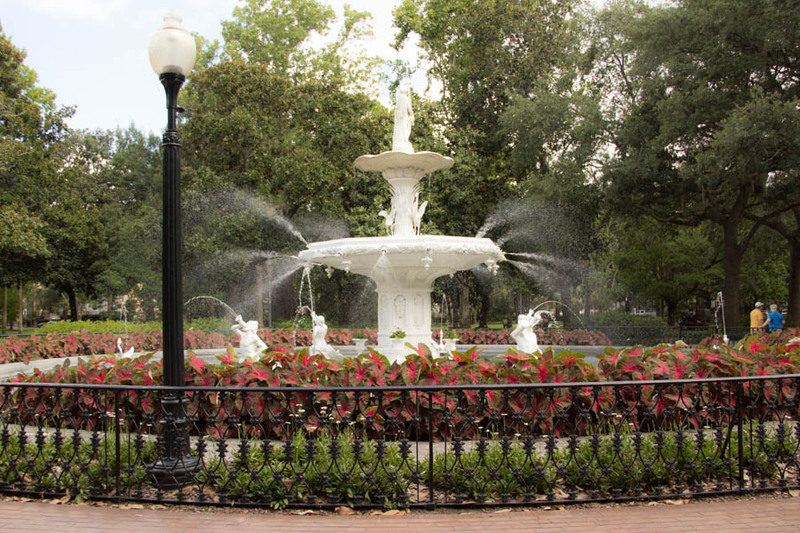 Forsyth Park- this fountain is a landmark at the park. Love the mer-men! I also love the squares and lay out of Savannah and each section of the park. Students from nearby art school paint, draw and play music as you are walking by. 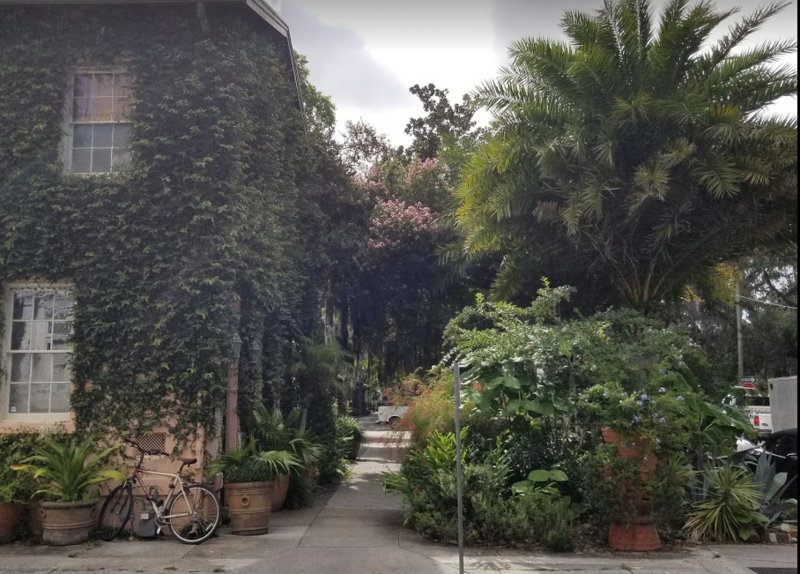 We stayed in a pet friendly apartment, in the Historic District, as we do enjoy bringing the pups and found Savannah to be a VERY dog friendly city. We visited shops, boutiques, and other places where the dogs were welcome. I was told if you have a dog in Savannah, you will be greeted like a celebrity! Haha, I found that everywhere we went, smiles followed, kids asked to pet, and we were stopped and asked what breed of dog they were. The first evening, I spied a cute clothing boutique on the Riverwalk, and the dogs were gladly excepted into the shop. My husband saw a sign outside the shop that read, ” 50% off 1 item for your Birthday week”. How lucky! So, with ID in hand, I tried on several dresses and walked away with two. I’m wearing the one green, tropical style dress here, and the other you will see on the blog soon. We spotted RMC Boutique on the Riverwalk and I was swept in by spying this green tropical shift dress upon entering the store. We met a wonderful lady, whose hubby was in the military and she enjoyed working for the shop, in addition to making her own jewelry. We talked fashion for a while, and I browsed, quite happy with my selections. What’s great is that I can purchase from them on-line, as I am now aware of their sizing. The first evening we spent walking the Riverwalk, shopping at several boutiques and having a cocktail or two , enjoying the view. 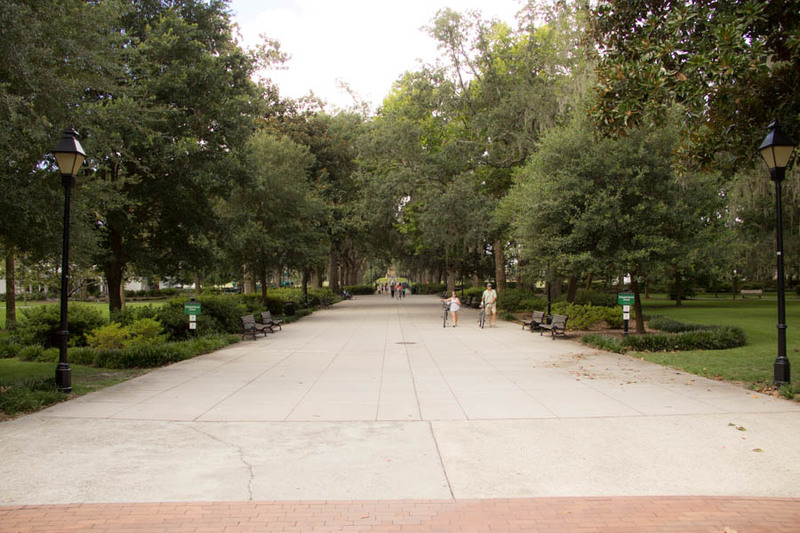 We walked around Forsyth Park, a landmark in Savannah, with over 30 acres in the Historic District. A beautiful fountain lined with flowers and filled with mermen is at the center of the park. We enjoyed walking to the fountain as we were mesmerized by the street trees- live oak with Spanish moss which line each side of the walkway and are the predominant tree along the street. We knew we wanted to go to one or two of acclaimed fine dining restaurants and I knew about and chose The Olde Pink House. with most popular Southern style cuisine around. This 18th century mansion was lovely and quite elegant, as we dined in celebration of our 16th Anniversary and my Birthday. 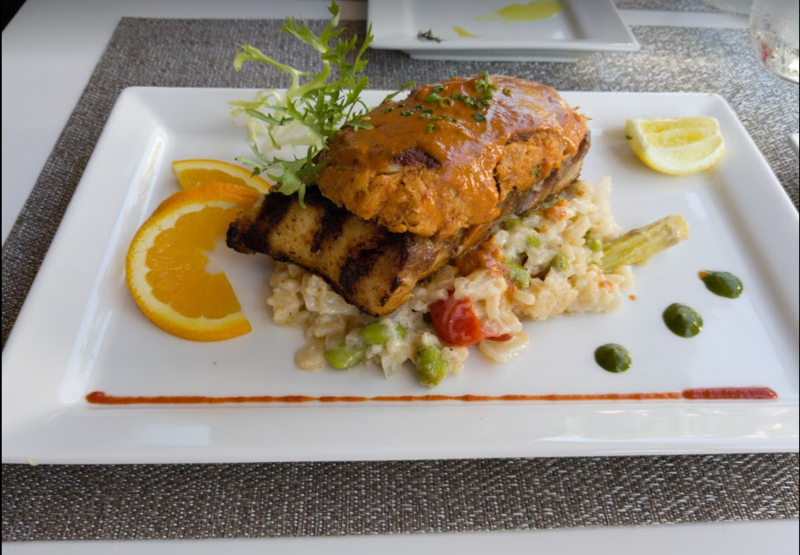 The meal was amazing, as I am able to enjoy seafood every night, and the crab stuffed grouper was no exception! I have been on a Rose and Viognier kick, so we sipped several glasses of wine with our meal. Later, the waitress brought out two plates with these declarations written in chocolate and whipped cream. A great end! 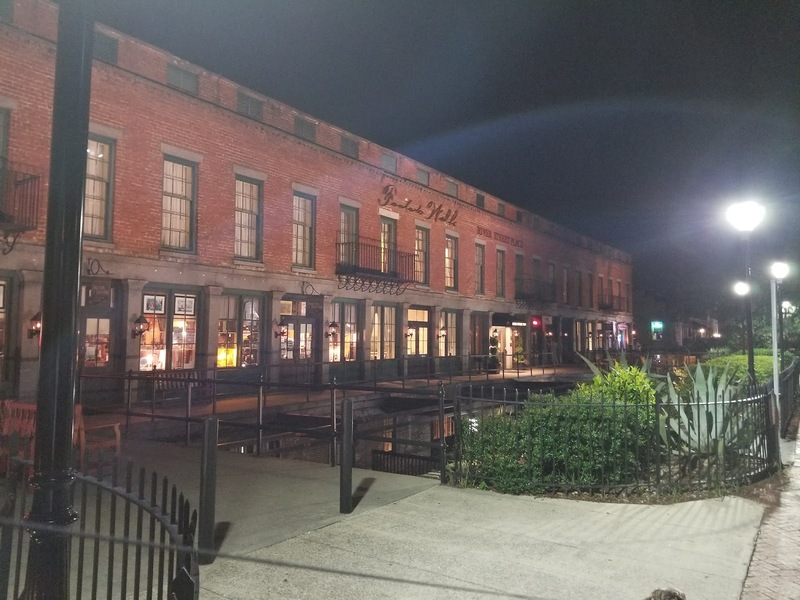 I can’t say enough good things about the food from Chive, a restaurant we ate at the last day, outside, as well as the Olde Pink House, a landmark in Savannah. We went all out and indulged in our favorite seafood dishes, along with some excellent wine and cocktails. The last evening, we drank overlooking the sunset from the bridge at the Riverwalk, myself enjoying a refreshing Cucumber Cooler, while my hubby enjoyed a crisp Mule. So good! Gibson at Chive. Mmmm. steak or salmon? 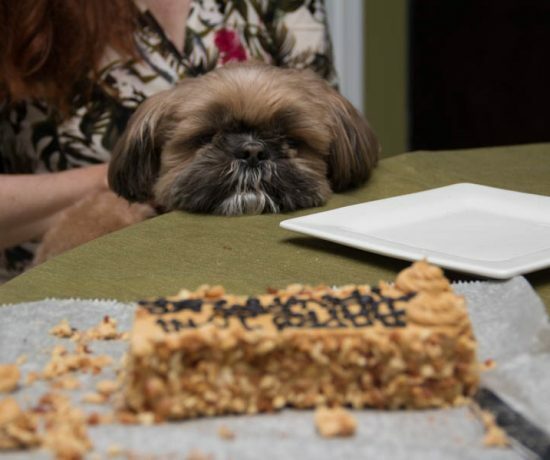 Waiting to be served. Here I am wearing one of the dresses I received for my Birthday. I love the tropical vibe and the bright pink flowers. It doesn’t wrinkle either, which is a plus when traveling.It was quite hot, with a breeze, so the entire trip, my hair was in an up-do or chignon. It’s a necessity! 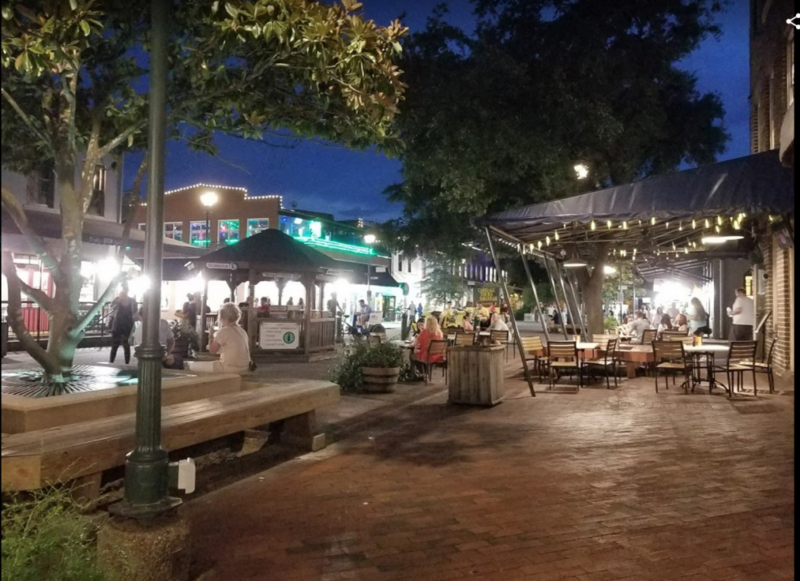 Pic of City Market – restaurants, shops, music. We stopped for Gelato one evening. We explored, ate, drank, shopped, walked, satisfied our “history bug” and also went to Tybee Island, a beautiful beach with marshes and less of a crowd, was right up our alley. Tybee Island is a barrier island and small city near Savannah, Georgia. It’s known for its wide, sandy beaches, including South Beach, with a pier and pavilion. In the island’s north, Fort Screven has 19th-century concrete gun batteries and the Tybee Island Light Station and Museum. The still-functioning 18th-century lighthouse has been rebuilt many times. I will be posting part II of my Savannah vacation later in the week, so please do stop by for pictures and info on Tybee. Don’t you always feel your summer vacation goes by too fast? The drive was only 4 hours, so it was an easy trip and we will be back, as there is much to see and do. 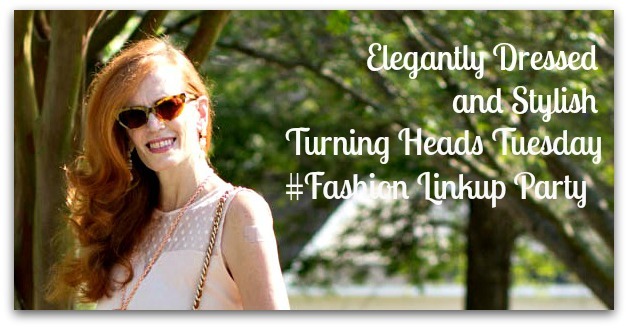 SO TODAY, WE ARE BACK TO TURNING HEADS TUESDAY LINKUP! I ALWAYS ENJOY SEEING YOUR OUTFITS AND SUMMER LOOKS! Its that HOT HOT HOT time of year, so let’s see how you have styled those outfits. Please do visit other bloggers and leave a comment, 2+ per blogger, as well as linking up any fashion, beauty or lifestyle post. I always meet new people this way and it does make someone’s day. Savannah looks so pretty! I haven’t even been to Charlotte, but would love to visit there sometime. Such a beautiful dress! I just adore Savannah and all it has to offer. The food and atmosphere are simply amazing. Your tropical print dress is a fabulous piece and looks great on you! Great photos from Savannah, thanks for sharing. I love that pretty floral wrap dress and I love your hair up like that. 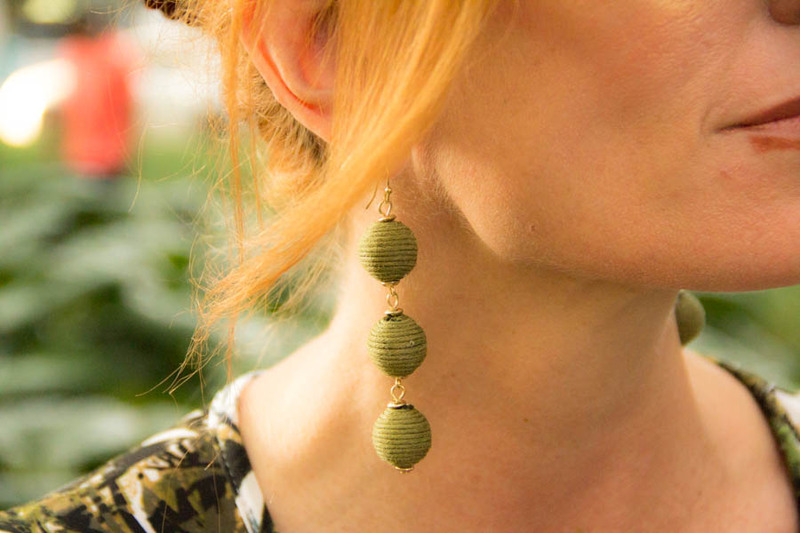 It shows off your pretty olive earrings which are the perfect match to that dress! It looks like a very interesting place to visit, Jess. I love exploring new places too. Love the dress you are wearing, lovely print and the fact that it wraps around your body contouring it in the right places. 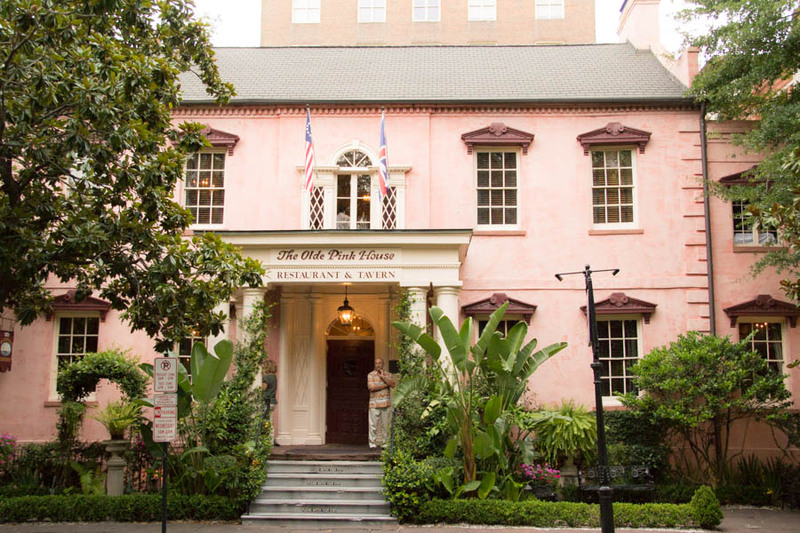 My hubby and I went to Savannah a few years ago and we also ate at the Olde Pink House. So good–I just remember having great seafood and biscuits! 🙂 Sounds like you had a wonderful time there and love the photos! 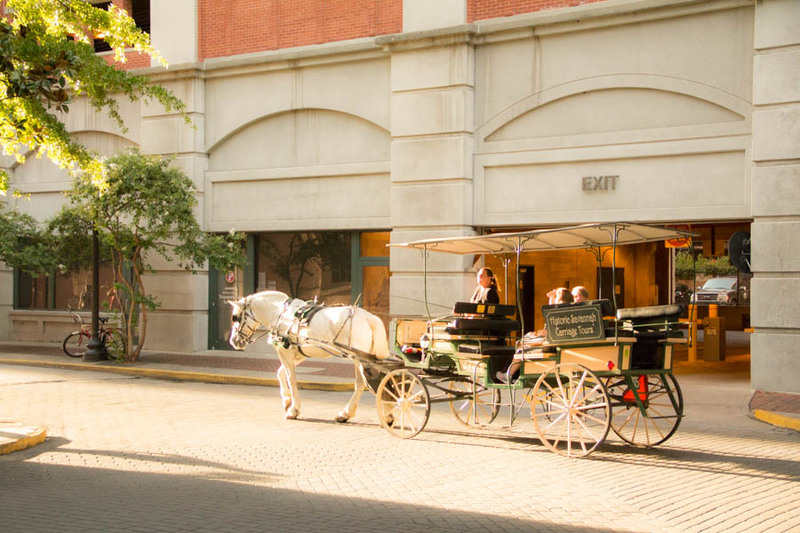 Savannah looks like a wonderful place for a trip, especially with fur babies! I love your dress, the colours and tropical print are gorgeous. Your hair looks lovely in a chignon! Thank you Emma! I loved the colors of the dress, and it was a fun piece to get in Savannah. I have to wear my hair up as it is hot! My daughter went to school in Savannah at Savannah College of Art and Design! She is in Boston now pursuing a career in ceramics. We love Savannah and miss it so much! Your pictures brought back so many great memories! Thanks so much for the walk down memory lane! I ate at Chive too. 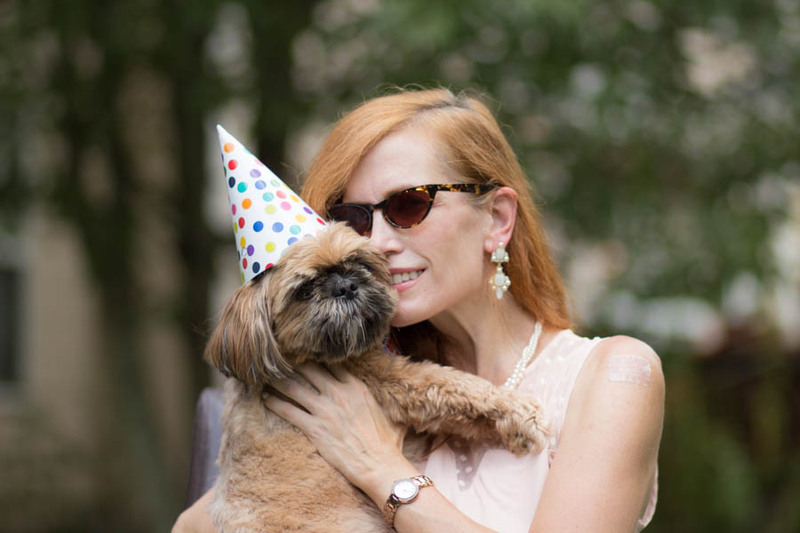 Dying over your dress and fur babies! What a fun vacation! Beautiful place! Thank you for sharing the pretty photos. You look fabulous in that floral dress. I have heard Savannah is beautiful and it sure looks like it from your photos. I am so glad you had a wonderful vacation and that dress is so pretty and it looks amazing on you. Savannah looks & sounds wonderful! I’m glad you had a nice vacation. And how great that you bought yourself a souvenir in the form of a dress! 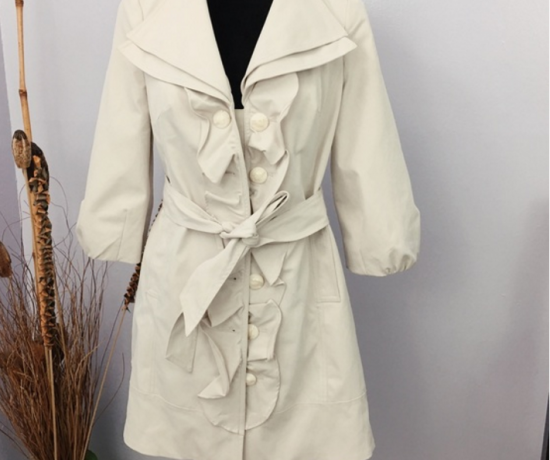 It looks absolutely amazing on you! And now every time you wear it, you’ll remember your time in Savannah! Thanks for the linkup & Happy Tuesday! It certainly is a beautiful place and you look like you had a fabulous time! The shots are beautiful as is the dress! How cool that you could take the pups along too! I really want to visit Savannah one of these days. Such a gorgeous place. Love this dress on you. The colors are perfect and those earrings are some of my favorite!! 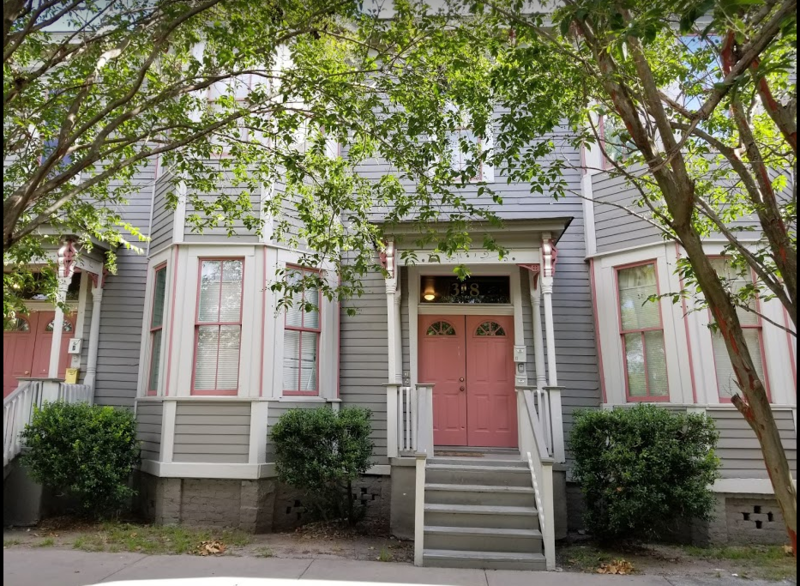 Savannah looks gorgeous, and how fabulous that it is so dog friendly! These photos are beautiful and you look amazing in that dress! This looks like a beautiful place to vacation! That is a seriously gorgeous wrap dress! I love to have my fur babies with me where ever I go! Peace! 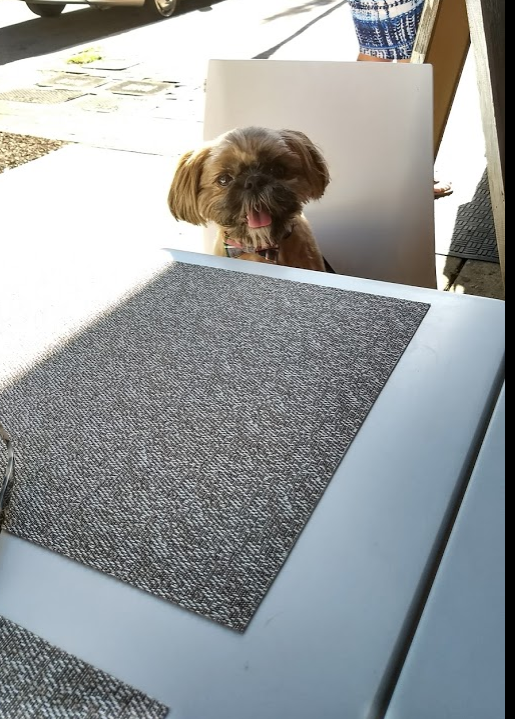 Love how you were able to take your adorable pups along even to dinner! 🙂 I wish more places here were dog friendly. We’ve found a few but not all are. I really like that dress you’re wearing, it’s a lovely style and print and anything you don’t have to iron is sure to be a winner! Hope you are having a nice start to the week! What a beautiful place to visit! And that dress was such a great find! I wish more stores had birthday discounts! Lovely pictures Jess, thanks for the intro to a place I was unfamiliar with! The tropical print shift is great on you – and the picture of you with the dogs is just adorable. Savannah looks truly amazing. Like the best place for holidays! Thank you for organizing your link up, I joined. I adore Savannah and the Olde Pink House has a special place in my heart! What a great trip! LOVE that dress too. I would totally buy it too! Those are some fabulous photos of your vacation, Jess!! We’ve only been to Savannah once, but had a magnificent time as well!! I can’t wait to hear more about it!! Beautiful place! Love your dress! wow! It looks gorgeous! I pinned it to my bucket list. I haven’t been to Savannah yet, I’ll have to suggest it to my husband. I’ve always wanted to go to Savannah. Such a quaint town! It looks like you had an amazing time! 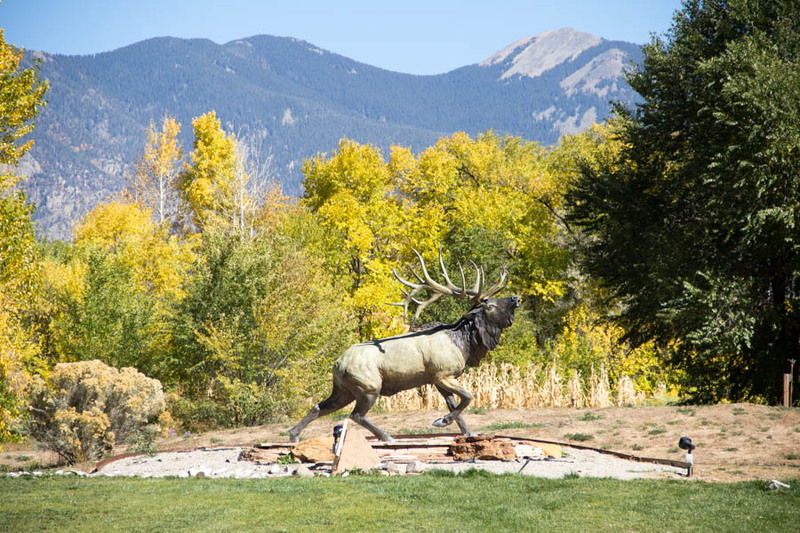 Gorgeous photos, Jess! Savannah sounds like an amazing place to visit! You look amazing in this dress, too. And those earrings are simply fabulous. I love Savannah!! Gorgeous dress! Your new dress is lovely on you. Glad to hear you enjoyed your holiday break and it looks like the pups did too. I remember Savannah from my visit there way back in 1983, I loved the history and the glorious buildings. Many thanks for hosting Jess. Good to read that you had a very nice time! And your lovely dogs too! Such a nice place for the holiday. It seems that you had amazing time. You look fantastic in this dress. Perfect choice for the holiday. Lovely setting for a lovely lady and your dress is beautiful Jess! Have a great week Jess!